The experts' team sent by the religious authority directs aircrafts to monitor what has been achieve, and Sayed al-Safi describes the transgressors on the water network by "leech". A source from the office of the representative of the supreme religious authority; Sayed Ahmad al-Safi stated to Al-Soumariyah News in Basra that: "The delegation of the supreme religious authority assigned by his eminence Sayed Ali al-Sistani to resolve the drinking water crisis in Basra, continues to hold its meetings, and technical and logistical field works. 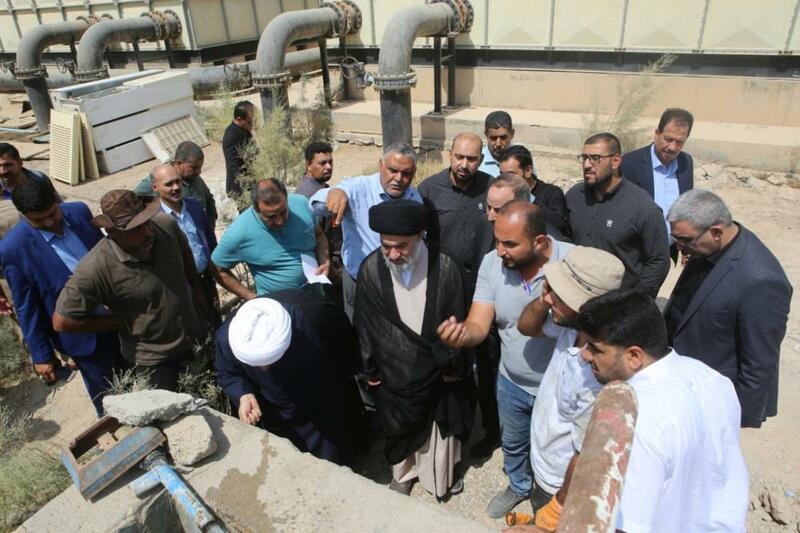 The experts' team accompanying Sayed al-Safi has taken many practical steps towards the solution, resulting that a number of neighborhoods of the city of Basra started receiving drinking water in the past few days." Adding: "Sayed al-Safi ordered to remove the transgressions on the network of pipes conveying drinking water pumped by the station al-Abbas (peace be upon him) to the Bad'a project, as they are contrary to the Iraqi law and to Sharia." The director of the office of Sayed al-Safi has described the transgressors by being like the leech that lives on the blood of others, as they are taking the water share of others, while knowing the importance of water in the people's lives, to sell it to them at high prices. The source confirmed that Sayed al-Safi has ordered the team of experts to buy 20 pumps for the Bad'a project and received two additional pumps as gift from the water directorate of Karbala cooperating with the team in this regard. Indicating that the experts' team sent aerial reconnaissance aircraft on the area of A'ali al-Garna, to explore the levels of release of drinking water, which were low of some dams on the Tigris River. The office stated: "The sweet water levels coming from the Tigris to Garna area have increased in the recent days following the decisions taken in the team's meetings with the delegation of Water Resources Ministry, which resulted the increase of water releases from some dams on the Tigris River, which reduced the salinity ratio of the water in the Garna area."